As any researcher knows, some things are harder to figure out than others. 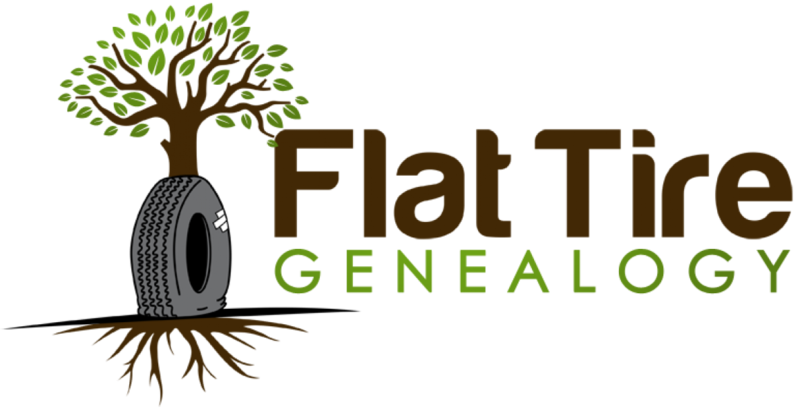 In the case of genealogical research, some branches of your tree will provide you with a rushing flood of information without any issues while others are simply a giant brick wall. In the case of the Repp side of my family, I had to do some heavy lifting in order to break through the proverbial brick wall of my family tree. When I first started researching my family tree, I had never even heard of the name Repp. 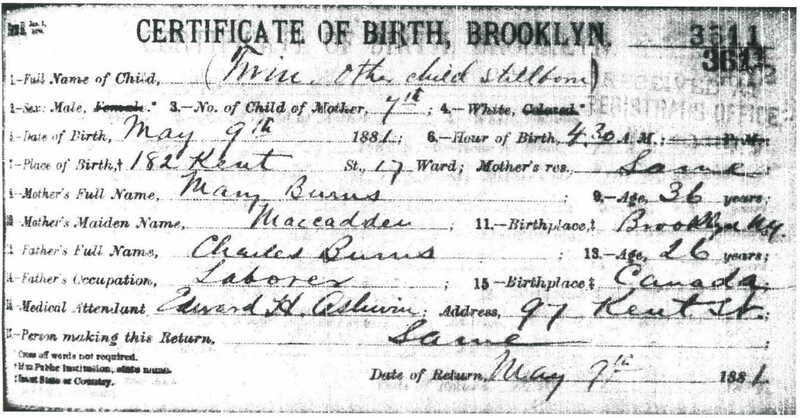 In fact, the only thing I knew about my great-great grandmother was that her name was Lillian Burns, though sometimes she was referred to as Mary, according to my grandmother, by her husband Henry Edward Burns. 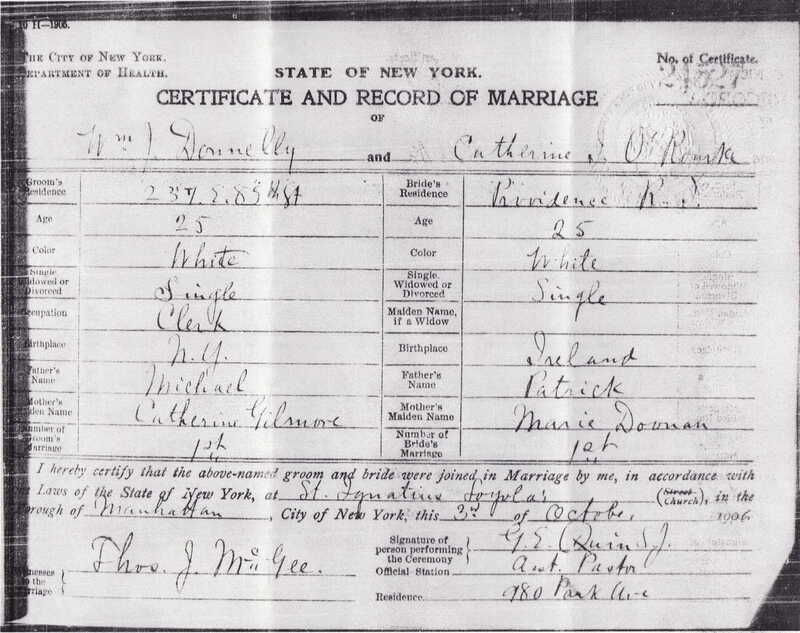 So, what was Lillian’s maiden name? Well, when I asked my grandmother she didn’t know, not because she didn’t know the name, but rather she had heard of two names – Lillian Cortland and Lillian Holland. According to my grandmother, her grandmother Lillian was not very open about her life and she spoke very sparingly about her family. From what my grandmother has told me, Lillian stated that she was raised by her grandmother and an Uncle Chris and was not close with either of her parents. My grandmother also stated that she had heard that Lillian’s mother was an opera singer or some other type of performer that kept her constantly on the road and her father was not active in her life. Now, although this was good information to start searching to build my tree further, it didn’t produce a lot of leads. For example, Lillian lived with her grandmother and an Uncle. But were they Cortlands? Were they Hollands? Were they her paternal relatives? Were they her maternal relatives with a completely different last name? Did Lillian take on her father’s name or perhaps a stepfather’s name at birth? All questions I didn’t know the answers to. It turns out, her name at birth was Lillie Mary Repp. You might be asking yourself how I could have managed to find this certificate. Well, after giving up on running countless searches of both Cortlands and Hollands with Lillian’s birth year, I came across a website called Fulton History, a newspaper search engine that contains many of New York’s historical newspapers. 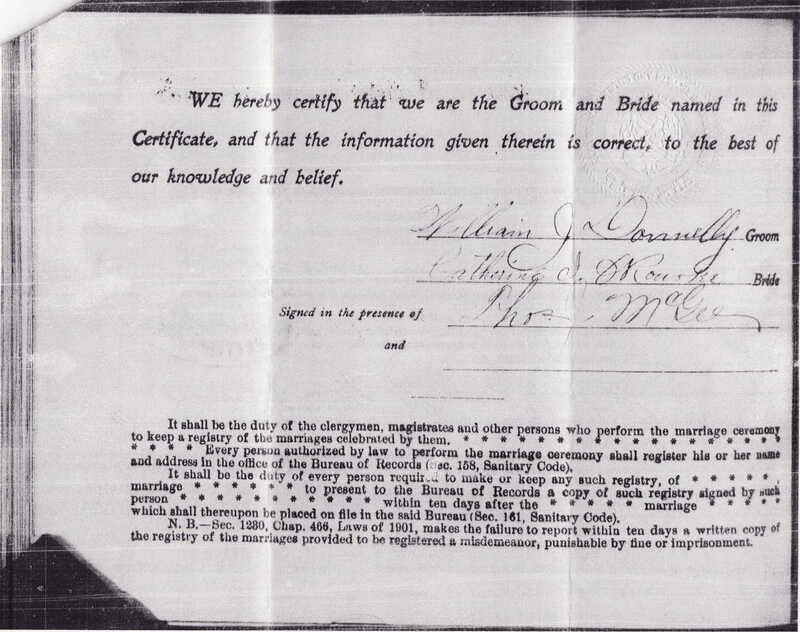 One of the first things I found was a notification of Lillian’s marriage to Henry in 1913. As you can see, she appears here as Lillian Cortland. But it was this next document that opened up the floodgates. On January 28, 1929, Lillian’s mother Margaret Holland passed away. 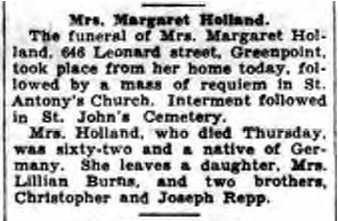 As you can see from the obituary, she is survived by her daughter, and her brothers Christopher and Joseph Repp. I had found Uncle Chris and apparently Uncle Joe too. This document was really the key to breaking through that brick wall. From there, I found more and more records and I was able to figure out the entire make-up of Lillian’s family (with the exception of her father). As you will notice, it is more than evident that Lillian was right when she said she was raised by her grandmother Catherine Repp and her Uncle Chris. In 1900, Catherine Repp is living in Manhattan at 610 East 17th Street with her daughter Margaret, her sons Joseph and Christopher, and her granddaughter Lillian. In 1910, Catherine, Margaret, Chris, and Lillian are living in Brooklyn at 218 Monitor Street. By 1915, Lillian has moved into a new residence with her husband Henry. Uncle Chris and her mother Margaret are still living with their mother, this time at 187 Moffat Street in Brooklyn. Again using the Locate A Loved One search engine, I was able to find the exact gravesite of where Catherine Repp and Margaret Holland were buried. Catherine’s son and Margaret’s brother, Joseph A. Repp, is also buried with them. Here is their headstone. Unfortunately, it appears as if Catherine’s name was the only one that got inscribed. I hope to one day add the rest of their names. There’s certainly more Repps out there. I look forward to finding them! Next on my list of locations to visit in St. John’s was the Burns. One of my more difficult branches to research (mainly due to the commonality of the Burns surname), my Burns ancestors were one of my favorite branches to conquer. It started with, of course, interviewing my grandmother (who was born a Burns). 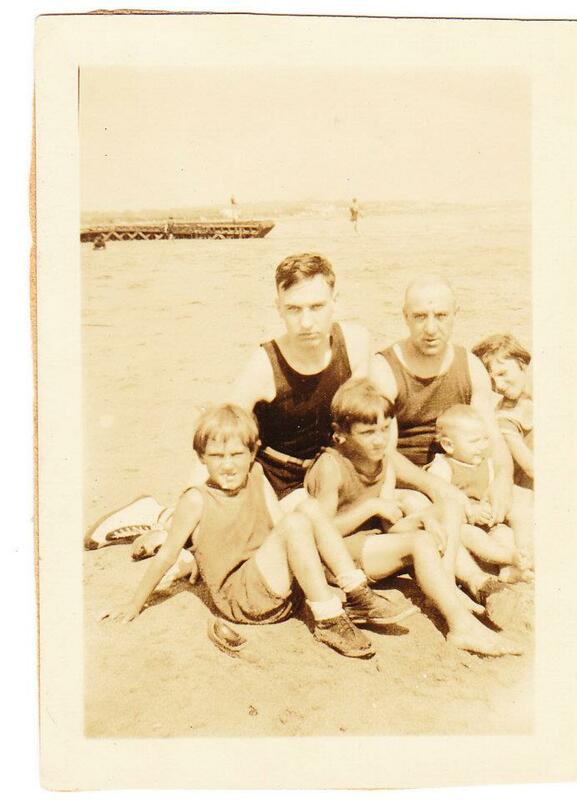 My grandmother remembers all sorts of stories about her grandparents, and one of the most interesting characters, was her grandfather Henry Edward Burns (1881-1963), who went by Harry. He was your typical jolly, hard-working, jokester of an Irishman who allegedly had to give his wife his paycheck every payday out of fear of blowing it all at the bar. For the longest time, I was unable to pinpoint his birth record. 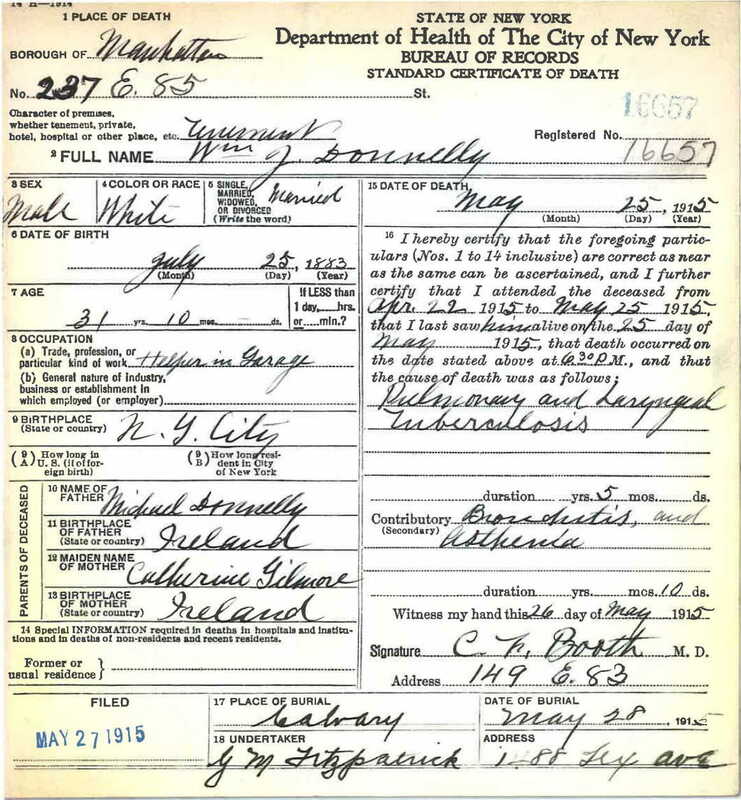 Born in 1881, there was a good chance he may not have had a birth record. 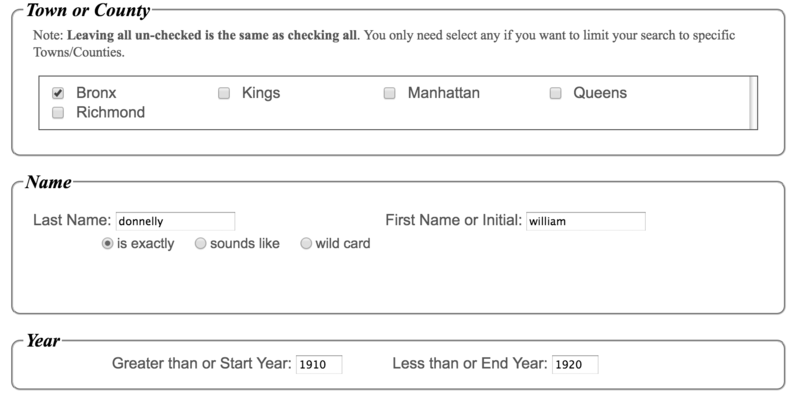 However, I didn’t give up running searches and rather than running a search with his first name, I simply ran one for the year 1881 with just the last name Burns. This is what I came across. May 9, 1881 was his birthday. Charles Burns was his father. There are two records though? One of which has a death date of the same day? Did my 2nd great grandfather have a twin? I couldn’t wait to tell my grandmother as I was sure this was a piece of information she had never heard before. Maybe not the best joke to make about the twin he never got to meet, but that just goes to demonstrate the good nature of the man. Even the most tragic of scenarios could be infused with a little bit of humor. This opened the door to another generation and led to a number of other discoveries, including where my 3x great grandparents were buried. 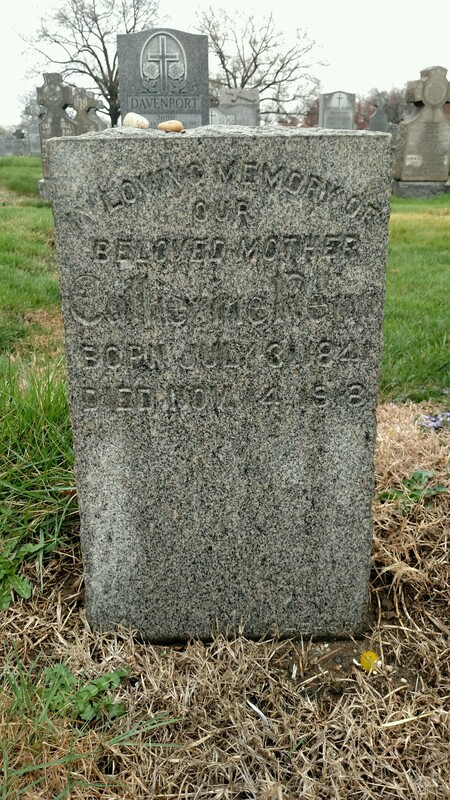 Charles Burns was not buried with his first wife, Mary McCadden. 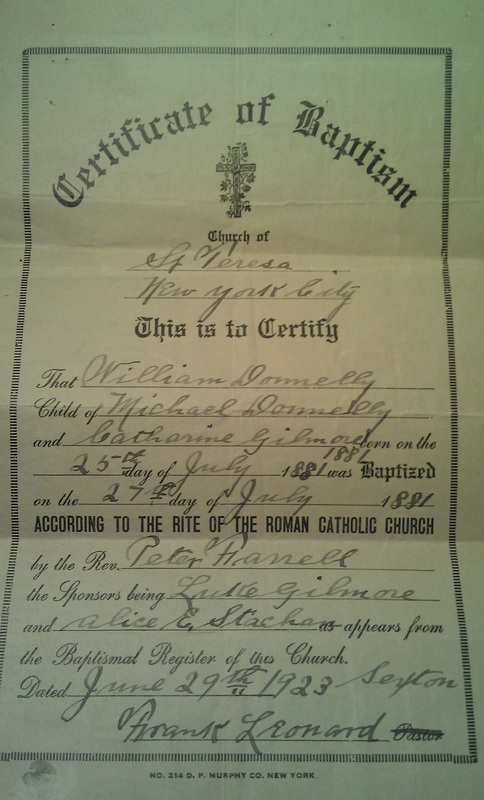 Instead, I came to learn that Mary had passed away on May 22, 1900 and was buried in a plot at Holy Cross Cemetery in Brooklyn presumably where her infant son was also buried. Charles Burns remarried a couple of years later to Margaret Catherine Scally (1877-1939), and had two more children, Daniel Francis Burns, and Margaret C. Burns. All four of them are buried together in the plot seen below. 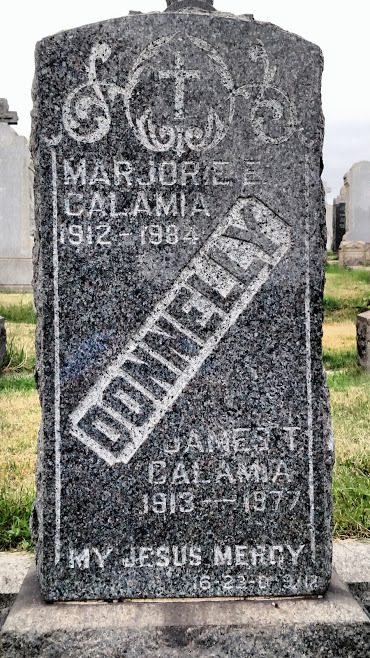 Unfortunately, there are no names inscribed on this headstone – just the Burns surname signifying it is the Burns Family Plot. In that moment, I thought perhaps there used to be footstones marking each individual’s name. However, Margaret C. Burns (their daughter) had passed away in 1990 and Daniel F. Burns (their son) had passed away in 1982. According to my grandmother, Margaret and Daniel lived together their entire lives, never married, and never had kids. Their father was first buried there in 1928 and their mother next in 1939. Why did they never get their names inscribed? 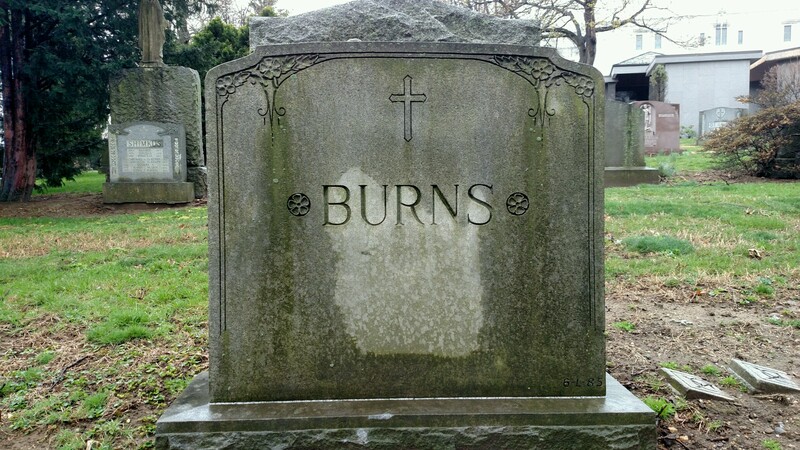 Was it their wish for the stone to only say Burns? Why leave all of that space on the stone then? Did two earlier footstones exist? Who was responsible for their burials? All questions I’d like to find out answers to. I can’t imagine they would have not wanted their names on their headstone. How would they be remembered? All it says is Burns. Anyways, if it was indeed just due to the lack of follow through on the part of other family members, I want to make sure that I am one day able to get their names inscribed. In the meantime, they will be memorialized here. If you want to support my research and quest to make sure that all of my ancestors are properly remembered, please let me know. I started Flat Tire Genealogy to ensure that no one in my tree would be forgotten. So, anything you can do to help, especially if these people are in your tree too, would be greatly, greatly appreciated.